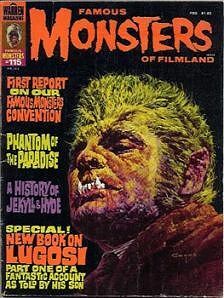 April 1975 issue of FM with cover featuring a Basil Gogos painting of Henry Hull as the "Werewolf of London". The trivia quiz has been completed in pen on pages 29 to 34 and two pictures have been clipped out of page 43. Otherwise excellent condition. Henry Hull only made one horror picture, but it was the first werewolf movie ever flmed. It wasn't a great film, but it wasn't bad. Warner Oland appeared in a non-Chan role as the werewolf specialist. Another odd thing was that the werewolf in this movie spoke, whereas Chaney's monster just growled. Website design and hosting by Sohodojo Business Services. Item 112 of 466 items displayed in viewer. 0 items in cart.